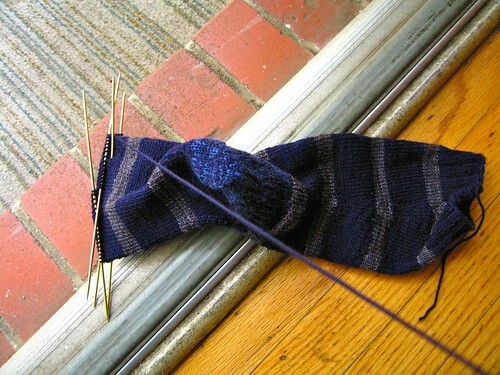 So, I’m here in California, and here’s how far I am on Adam’s second sock. Just a few more stripes to go before it’s done! It’s nice to have some knitting while I go around in the car with my parents (I’m licensed to drive, but am such a terrible driver, I really can barely do any driving at all). Heading out to a doctor’s appointment soon–with my knitting, of course. I was thinking of re-reading Infinite Jest, but it’s a little daunting with everything going on. I did read Princess Diaries 10, Forever Princess, by Meg Cabot, (the final installment in Princess Diaries), which I recommend, and A Harlot High and Low, by Balzac, which is also kind of a sequel (to Lost Illusions). Maybe I should read all the Gossip Girl books instead–might be light enough. I’ve been threatening to read them out loud to my dad–don’t know if he can take all the Serena/Dan/Nate/Jenny intrigue! Posted in travelingproject, Uncategorized at March 23rd, 2009.